Rosemarie Carvalho, a foreign language teacher at Crosby High School in Waterbury, Connecticut, has been a friend of Warm Up America since the mid-1990s. Her knitting program started quite by accident when a student, who was a star football player, saw her knitting and asked her to teach him. Initially, Rosemarie thought he was just teasing but told him to come by during a study period if he was interested. To her surprise, he showed up and focused on learning to knit, even when teammates laughed at him. As you will read below, over the years the group met at study hall or after school. Together they completed numerous Warm Up America! afghans and donated them to local charities, taught area grammar school kids how to knit, and won numerous state and local recognition awards. In 2008, Rosemarie was named Crosby High's Teacher of the Year! Here are more details about the Crosby High Knitters. 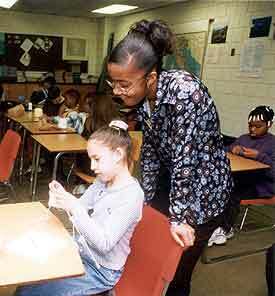 Over the years, the size of the Crosby Knitters has varied from a hand full of students to more than 100. Whether Rosemarie has a study hall assignment also has an impact. She estimates, the student efforts have resulted in the completion and donation of more than 50 afghans. Following are excerpts from letters Rosemarie shared with Warm Up America! over the years and help to explain how the Crosby Knitters group evolved. I have study hall again this year and I've already spoken to them about Crosby's Warm Up America project. I have a few students who already seem receptive and willing to give knitting a try. The boys seemed more interested than the girls. I also have another knitter who is eager to recruit new knitters and get started. From that study hall, our group seemed to grow by leaps and bounds! Then I opened it up to the entire student body and did I ever get a response. I had some 50 students (half of whom were male) crowd into my room last Wednesday during the monthly activity period. Since then, I've had another 15-20 students stop by my room to inquire about knitting. I had to put some of them on hold until next week because I just didn't have all the needles. I depleted the local supply of No. 7s. Knitting mania has really caught on at Crosby. There are so many students walking the halls with their yarn and needles. Students are knitting in their study halls, in their homerooms, library and even at Café. One of my students told me that she saw a boy knitting while walking to school. Because of the students' knitting, the physical education teacher even started knitting again. The knitters' group is also quite diverse. I have some really good students sitting next to students who have unusual and troubled backgrounds. I have some students who were so anxious to begin knitting that they went out and bought their own needles, but unfortunately not all of the students have the financial means so I depend on donations or what I buy myself. A local yarn shop in Cheshire has given me bags of yarn, which people have dropped off at the shop for this year's Warm Up America! project. I've learned to ask for a needle deposit (the cost of the needles) that I refund to students if and when they return the needles. That way, if a student decides to stop knitting, his/her return of the needles means that I have needles for other perspective knitters. Just this week we received two rather large donations from individuals who saw a small appeal for needles and yarns, which appeared in our local newspaper. I did have one small problem with a principal who at first did not want the needles to leave my room because she feared that they would be used as weapons. 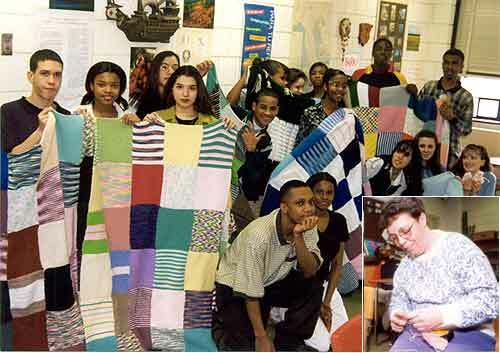 The students involved in Crosby's Warm Up America project knit to help those less fortunate. Each afghan block take anywhere from 2-5 hours to complete, depending on the knitter's expertise. When each knitter completes a block, he/she hands it in to be included in the next afghan. 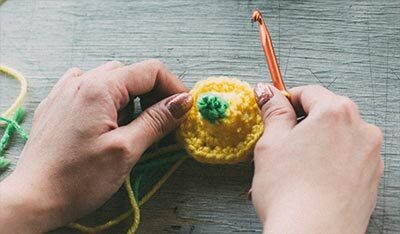 The knitters do not receive any course credit for their many hours of community service, but many have been able to write about their participation in Crosby's Warm Up America project on their college applications. The project has definitely had a positive impact on our school and on the students. 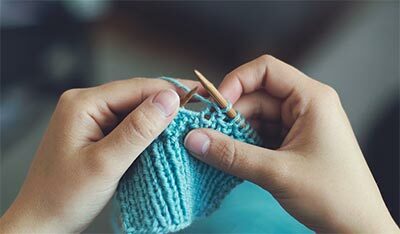 The knitters have learned a new skill, become involved, many for the first time, in a community service project, developed pride in themselves and many found that knitting has helped them to control their tempers or deal with some of the problems they are faced with as teenagers. Noticing the calming effect that knitting has had on some of the students, teachers have referred students to me. One of the Resource Teachers sent me a female student who is socially inhibited and may have been sexually abused in the past. Her mother does not allow her outside the house, except to come to school. They're hoping that knitting will help her to socialize and cope better. The knitting did just that! The vice principal wants to see if I can get a male student who has a pretty violent temper to come to one of the knitting session. One of last year's knitters had a really bad temper and said that knitting helped him to relax. My male faculty members thought I was crazy at first, especially when I told them that I had a lot of male knitters. Some of them have now seen these males knitting around the building and can't believe how mesmerized the boys are with their knitting and how they concentrate on it. As the librarian commented to me about a talkative young male, "He's a totally different person when he's knitting." When too many students overwhelm me, the more advanced knitters step in and help out. When an article about the Crosby Knitters, and a picture of our football-playing knitter, appeared in a local paper, the students received "fan mail" from 4th graders at the Rotella School, a grammar school in Waterbury, asking if they could come and teach them how to knit. Working with the 4th grade teacher, we arranged two sessions to teach the youngster how to knit and complete 7" squares for an afghan. Crosby knitters have also taught 3rd to 5th graders how to knit. The younger students look up to the high school students as role models and heroes. I have a student who knows how to crochet and who's teaching a few students to crochet. I gave quizzes most of today and used the quiz time to try and straighten my room out and organize the yarn stash. Last week I had gone out and purchased some of those see-though storage organizers. Today I tried doing some inventory of all the yarn. Now at least I have a better idea of what we have and the room doesn't look so cluttered…if that's possible! Several of the knitters have begun projects of their own this week with yarn donated to us for exactly that purpose. I have two students (a girl and a boy) knitting sweaters for themselves. Then I have a girl who wants to knit mittens, while her boyfriend wants to knit a headband. I do have to tell you that all this knitting has exhausted me somewhat, but I believe that it's worth it when I see the smile on a student's face after he/she has just mastered a new stitch or pattern, or has completed another block. I begin my day at 7:00 a.m. when the first buses begin arriving and students begin delivering their completed blocks or bombarding me with knitting questions. On Friday, I gave up my Preparation Period to teach the Resource Teacher's referral how to knit. I somehow managed to escape down to Café for a quick donut at lunch, but I carried someone's knitting with me that needed fixing. As I was leaving the building, a young man inquired whether I had managed to fix his mistake. I embarrassingly said, "No." When I discovered that he was staying after school for soccer practice and that he wanted to knit over the weekend, I took his knitting out of my bag and proceeded to fix it right then and there. I didn't realize how exhausted I was until I walked out of the building and then it hit me all at once. I managed to re-energize myself though as I recalled a student asking the vice principal as I left her office whether I was the "knitting lady." I once had a student with a birth defect that left her with a very short stump for her left arm. She informed me that she wanted to learn how to knit. I was to meet her prior to the start of school the next day. That evening though it dawned on me that she had no hand to hold the left needle. The student who was determined not to let her disability get in the way of her knitting had already figured out a way to compensate by holding the needle under her arm pit. I never thought knitting would generate so much interest among Crosby's student body. As several students have commented, "It's not as easy as it seems until you develop the skills. I hope that my experience and that of the Crosby High Warm Up America Knitters will serve as an inspiration to others.